Each year on Black Friday Goose Island releases its Bourbon County Brand Stout, a bourbon barrel aged stout. Each year people line up outside Binny's and other Chicago area retailers to get their hands not only on the Bourbon County Brand Stout, but also the variants that Goose Island also releases along with it. These variants, including a coffee stout and barleywine offering, are highly sought after, and certain of them command a premium on the secondary market. This year Goose Island partnered with Knob Creek on on of their variants, the Bourbon County Brand Stout Reserve. 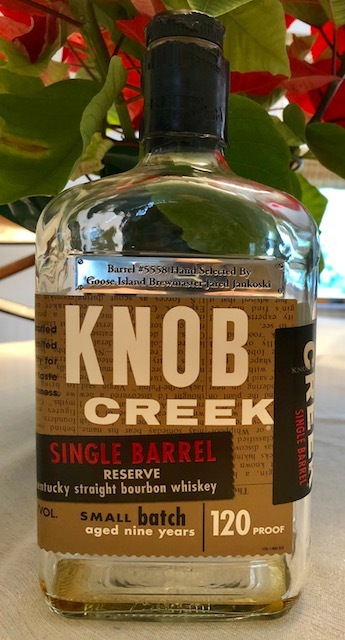 As part of the partnership, Goose Island hand-selected barrels from Knob Creek to use to age their Reserve. Obviously, in order to hand select barrels, they would necessarily have had to try the whiskey in them (otherwise they're just looking at some barrels and saying, "That one"). So, those hand-selected barrels were bottled and released, coming in fancy boxes and each labeled as "Hand Selected by Goose Island Brewmaster Jared Jankoski." These Goose Island picks flew off the shelves, but I was lucky enough to get a couple before they were gone, the first being this Barrel #5558. When I first popped the cork on this, the nose hit me immediately, which, unfortunately was a terrible thing. This is one of the worst smelling whiskies I have ever had . . . ever! It was pure ethanol on the nose, rubbing alcohol for days. And it was strong! I'd like to tell you about the other notes I got, but quite frankly there were none. This was pure nail polish remover. I had high hopes that the awful nose would fade as the bottle sat, but no such luck. That smell stuck with it from beginning to end. However, and as much as the nose made me think I was in for a terrible tasting whiskey, the flavor of the bourbon was actually really good! In fact, if it weren't for the awful nose, I'd say this was one of the better bourbons I've ever had. The spiciness of the bourbon hits you right away, packing a heavy cinnamon punch to go along with a health burn as well. There was quite a bit of vanilla up front as well. The immediate finish was dry and spicy, with a light peppery spice that I enjoyed. It was also layered with cinnamon and oak notes and an unsweetened vanilla flavor. The oily texture allowed these flavors to stick around for quite some time. This is where this bourbon got interesting, however. About two seconds after I swallow, I got a blast of caramel/toffee flavor at the back of my throat. It wasn't a subtle or light flavor, but rather as though somebody popped a Werther's into my mouth all of a sudden. I've never noticed anything quite like it before. It was incredibly noticeable and delicious, and it made me go right back for my next sip, wanting to experience it again! As I worked my way through the bottle, it took on more of a salted caramel flavor, much like that caramel blast I was getting but more throughout. However, that kick of caramel after each swallow was still there. I don't know what to make of this bourbon or exactly how to grade it out. Ultimately I'm drinking the stuff, not snorting it, right? So the nose shouldn't carry much weight. At the same time, it was so awful that it has to have some impact. Although this was one of the best whiskies I've ever tasted, I had a really hard time getting past the nail polish smell, which luckily didn't carry over to the taste. And so this one gets a grade just shy of an A from me.